TyasJetra Self Improvement Blog: Give your hundred percent to everything you do..
Give your hundred percent to everything you do.. There was a small village where a boy and a girl were staying together. Once they were playing together in a small field. 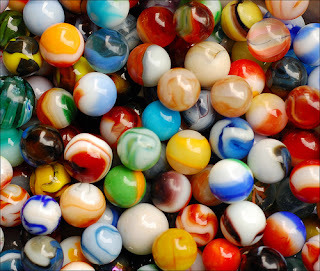 The boy had a collection of small marbles. The girl had some sweets with her. The boy told the girl that he would give her all his marbles in exchange for her sweets. The girl agreed. That night, the girl slept peacefully. But the boy couldn't sleep, as he kept wondering if the girl had hidden some sweets from him the way he had hidden his best marble. Moral of the story: If you don't give your hundred percent in a relationship, you'll always keep doubting if the other person has given his/her hundred percent. This is applicable for all relationship like love, friendship, employer-employee relationship etc. Give your hundred percent to everything you do and drive home happily.